Amen to all that (although for those keeping score at home, this year’s series so far weighs in at around 54,000 words). Your content is yours. When you post something on the web, it should belong to you, not a corporation. Too many companies have gone out of business and lost all of their users' data. By joining the IndieWeb, your content stays yours and in your control. The Indie Web posits itself as an alternative to the corporate Web, but it is a powerful alternative to much of ed-tech as well, which as this series has once again highlighted, is quite committed to controlling and monetizing students’ and teachers’ connections, content, and data. This year, I’ve changed the title slightly, from “Indie Web” to “Indie Ed-Tech.” I’ve done so because I want to extend my analysis beyond the Web, as a tech or as an idea. Nevertheless, much of what I plan to highlight in this article remains the same as what I wrote about last year: indie ed-tech underscores the importance of students and scholars alike controlling their intellectual labor and their data; it questions the need for VC-funded, proprietary tools that silo and exploit users; it challenges the centrality of the LMS in all ed-tech discussions and the notion that there can be one massive (expensive) school-wide system to rule them all; it encourages new forms of open, networked learning that go beyond the syllabus, beyond the campus. It’s not only a different sort of infrastructure, it’s a different sort of philosophy than one sees promoted by Silicon Valley – by the ed-tech industry or the (ed-)tech press. One thing I found striking when I began working on this article was that almost none of the sources were trade magazines. These just aren’t the kinds of stories that Wired or Techcrunch or Edsurge tend to write about. Instead the sources I’ve drawn on here are primarily blog posts written by instructional designers and professors and entrepreneurs and published on their own websites. See, there’s a world of fascinating and innovative things happening in ed-tech. (Or at least there are pockets of rebels scattered across the Pacific Northwest, in the mountains of Italy, in Bristol, in Fredericksburg, in Wagga Wagga, and elsewhere…) You just need to look beyond the industry PR. Yes, despite all the caution and concern about “a world that no longer forgets,” the Web is actually quite fragile, in part because we continue to post content to sites that we do not control. This impermanence has major ramifications for scholarship. 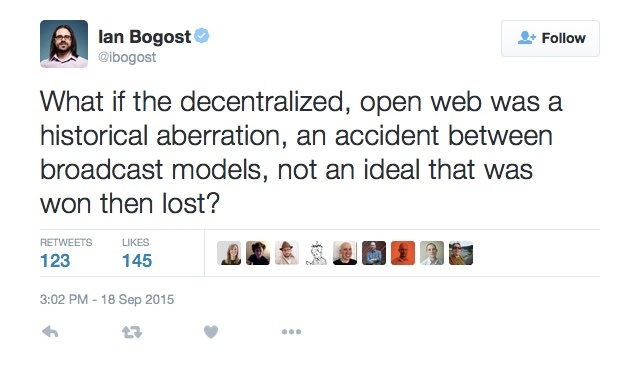 To push back against the brokenness of the Internet is daunting. It probably involves, as Sunde argues, dismantling global capitalism. To push back against the brokenness of ed-tech is challenging in its own right, no doubt. 2015 was a record-setting year for ed-tech investment – I’ll cover this in more depth in the last article in this series – and all that venture capital is accompanied by powerful narratives that encourage, among other things, pervasive data extraction, automation, and algorithmic decision-making. But the “indie-ness” of indie ed-tech isn’t simply a matter of the technology or the business model. Gratuitous self promotion: I wrote a book on this topic this year titled Claim Your Domain – And Own Your Online Presence. One of the cornerstones of indie ed-tech has long been the Domain of One’s Own initiative at the University of Mary Washington, which gives Web domains along with pedagogical and technical support to students and faculty. The domains are theirs, not the school’s. DTLT (the Division of Teaching and Learning Technologies) at UMW experienced a significant shake-up this year,when Jim Groom submitted his resignation in order to work full-time at Reclaim Hosting. There he joined former DTLT-er Tim Owens at their new startup, one that offers hosting and support services for other schools and teachers to run similar “Domain of One’s Own”-ish efforts. In September, UMW announced Groom’s replacement: Jesse Stommel who left the University of Wisconsin Madison to become the new executive director of DTLT. (Stommel’s thoughts on “Leaving Wisconsin.”) Also joining DTLT: Lee Skallerup Bessette. With these hires, it appears that DTLT will remain a site of important, student-centered (feminist!) ed-tech innovation. Often when I write about the importance of the “Domain of One’s Own” initiative, someone will sneer “but it’s just a blog.” Or when I write about the significance of Reclaim Hosting, someone will argue that “hosting is not innovative at all.” These responses miss the point of what sets these indie ed-tech efforts apart – technologically and philosophically. They fail to recognize the importance of networked scholarship, for starters, but they also tend to give too much weight to theories about “disruptive innovation” and the ed-tech industry’s own descriptions and expectations of what that looks like. Indie ed-tech isn’t just about “blogging,” of course. And it isn’t just about “blogging” as a replacement for closed and/or proprietary tools like learning management systems and e-portfolios. It’s not just about annotation, and it’s not just about commenting – but maybe, just maybe, there’s some hope, thanks to Indie Web startups like Known and Hypothes.is, that these too can be “reclaimed” for education purposes, again under the control of learners and scholars themselves and not under the control of companies that want our data in order to build their algorithms. “Blogging” tools might be poised to become something new in their own right – that’s one possible result of the latest WordPress.com management system, Calypso, some contended when it was released this fall. “Calypso is the Future of Personal Cyberinfrastructure,” Washington State University’s Mike Caulfield argued. These sorts of experiments with “personal cyberinfrastructure” are underway not just at the University of Mary Washington, but at Davidson College, the University of Oklahoma, Brigham Young University, and elsewhere – including high schools. This remain crucial: “personal cyberinfrastructure” mustn’t be unwieldy. It shouldn’t be too complex. That’s a huge challenge. The arc of the ed-tech universe is long and it bends towards the bloated LMS. Ideally, indie ed-tech should be SPLOT: the “Simplest/Smallest Possible/Portable Learning/Latest Online/Open Tools/Technologies.” It should be MYOS: make your own stuff/mind your own stuff/manage your own stuff/my online self/my operating system. We still have a ways to go. Like I said, this is an aspirational post. …It’s exactly the model that Downes and Siemens advanced all those years ago in the first cMOOCs: “Aggregate - Remix - Repurpose - Feed Forward.” But the tools used there – wiki, blogs, etc – were, in my opinion, not as well suited to the cycle as they might have been, at least for certain types of endeavors. Blogs tend towards conversational and quotative reuse, which is great for some subject areas, but not so great for others. Wiki feeds forward into a consensus process that provides a high level of remix and reuse, but at the expense of personal control and the preservation of divergent goals. In working on Wikity, as well as on a keynote he delivered at the dLRN conference this fall, Caulfield has outlined some of the most thought-provoking ideas about how we might rethink the Web and ed-tech’s position on it. This isn’t a matter of restoring the Web under the auspices of a nostalgia for “the Web we lost,” although it does include a nod to a much earlier vision, that of Vannevar Bush and his Memex. “In the world of the Memex your space houses things useful to you, and the space of a literate person includes many things one disagrees with but finds useful to think with,” Caulfield imagines. So how do we build tools that meet the needs of progressive, networked teaching and learning rather than trying to tweak the Web (and the increasingly powerful social media stream) that we’ve inherited? Based on the blog posts that emerged from the OpenEd conference in Vancouver in November, there seemed to be a rift (or rifts, more accurately) between and among those in open education. “What counts as ‘open’?” is a question that’s long been up for debate. This year another key one emerging from the conference seemed to be “are open textbooks the right place to focus?” Are “open textbooks” indie (or indie enough)? Is “open” challenging the educational status quo enough? Updates from open textbook initiatives: Virginia’s community college system announced in May more funding for an open textbook initiative, modeled on Tidewater Community College’s “Z-Degree.” Manitoba announced an Open Textbook Initiative in September, one that will create a library of free and openly licensed textbooks for the province’s most highly enrolled college classes. In November, Northern Virginia Community College’s Extended Learning Institute and Lumen Learning announced a partnership to publish 24 online college courses, based on OER, for two complete degree programs. An update on British Columbia’s open textbook project, penned by Tony Bates in November, notes that the project has resulted in an estimated savings for students of between $927,200 and $1,204,762. (Another update from Bates earlier this year: the cost of developing an open textbook is $80,000 - $130,000). OER even found support at the federal level in 2015, with the US Department of Education hiring Andy Marcinek in September to be its first ever “open education adviser” and proposing in October a new regulation that would require any new intellectual property developed with its grant funds to be openly licensed. Of course, if the feds embracing OER doesn’t make you question the indie cred of “open,” then ed-tech companies’ use of the word “open” just might. Case in point: McGraw-Hill and Microsoft announced this spring that they “embrace open learning,” according to a headline in the Ed-Tech Magazine at least. The story contained the phrase “compound learning object,” to which David Wiley responded with a little history lesson about learning objects and the Reusability Paradox. The prize for the most questionable act in open education in 2015 might just go to the University of Guelph which attempted this summer to trademark “OpenEd.” Thankfully the university responded to the outrage that ensued and backed down, saying it would release its claim (but noting that there was nothing now to stop others from trying to trademark them term). Rolin Moe responded to the trademark issue, highlighting some of the issues that seemed to be display – again – following OpenEd this fall: what are our assumptions about “open”? Recommended reading: “Reflections on Open Education and the Path Forward” by David Wiley. provides an interesting parallel for what we might consider Indie Edtech. Indie punk represents a staunchly independent, iconoclastic, and DIY approach to music which encompasses many of the principles we aspired to when creating open, accessible networks for teaching and learning at UMW. Make it open source, cheap, and true alternatives to the pre-packaged learning management systems that had hijacked innovation. The rise of the venture capital xMOOCs only reinforced that value of such an ethos. A lot of the technology is in place to achieve the goals of indie ed-tech. What’s a harder sell: changing the culture – among institutions, industry, and individuals – to support these goals. It’s the culture as much as it is the technology that gives us the very dystopian ed-tech I’ve written about throughout this series: the penchant for surveillance, for exploitation, for efficiency, for viewing students as objects and not as subjects of their own education. We don't simply need to rethink education technology; we need to rethink "school." …This is becoming increasingly important in education, where the rhetoric surrounding educational technology pushes simplification, ease, efficiency, and measurable-everything. This rhetoric goes hand-in-hand with the accountability movements (many call it “evidence-based practice”) at play in educational contexts.